Why Should We Go "Straw-less"? Straws.... We don't think too much about them as we sip our frosty beverages before tossing them into the garbage. Unfortunately, these seemingly innocuous items are damaging to humans, animals and our planet. Americans use 500 million disposable plastic straws every single day but they do not biodegrade. In the U.S. alone, there's enough straw litter waste to wrap the circumference of the earth 2.5 times a day, or fill Yankee Stadium over 9 times a year! 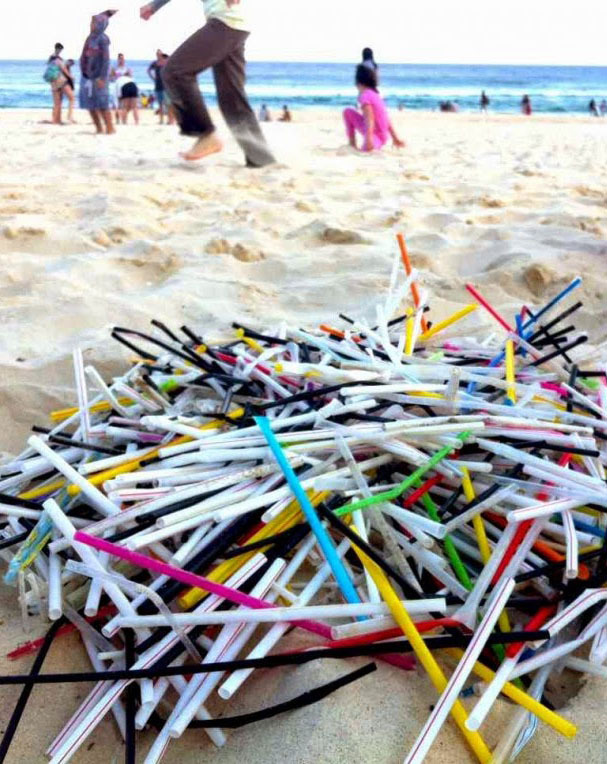 Straws are one of the most common litter items found on beaches. Marine animals mistake straws for food. They can choke on them or straws can get stuck in animals' nasal passages. Plastic straws are made from polypropylene, a petroleum-based plastic. In effect, a non-renewable resource is used to create a single-use, disposable item. Health issues: According to BreastCancer.org and a recent study by Environmental Health Perspectives, research suggests that all plastics - including those advertised as BPA free - may leach chemicals if they're scratched or heated. They cause wrinkles! Straw use causes people to purse their mouths and can create wrinkles from the repetitive muscle motion. Chewing on straws is bad for your teeth. It's a convenience; not a necessity. For most of us the use of plastic straws is just a habit of convenience, and habits can be changed with the desire to change. Food Establishment: Either opt out of serving beverages with straws or only serve straws on request. Resident: Choose not to purchase disposable plastic straws for home consumption and say "no thanks!" to straws at restaurants, unless they're reusable. Although straws can be essential for some with disabilities (and a necessity for parents of young children!) there are natural and environmentally safe alternatives. Paper: Aardvark Straws are customizable and durable (they can last for hours in water without disintegrating). There are more biodegradeable options on Amazon, too. Steel: Crate & Barrel sells a set of four; these Mulled Mind straws are handmade and come in different sizes and widths. Glass: Hummingbird Glass Straws are shatter-resistant and dishwasher safe. Bamboo: Brush with Bamboo‘s are grown organically, plus you can wash and reuse them. Grain: Harvest Straws are made from non-GMO grain and grown without chemicals. Brass: Modern furniture designer Chris Earl makes these reusable brass drinking straws at his home workshop in LA.